Lower Extremity Review (LER) has announced the publication of Recent Advances in Orthotic Therapy by Paul R. Scherer, DPM, MS, with an introduction by Kevin A. Kirby, DPM. The text is intended for the clinician who uses orthoses to treat mechanically-induced pathology. Recent Advances in Orthotic Therapy is a compilation of documented and anecdotal evidence regarding orthotic decision-making. The text is constructed in a manner to provide a logical approach to orthotic therapy, and therein establish the concept of pathology-specific orthotic therapy in clinical practice. Before purchasing your eBook, please be sure to download and authorize your free copy of Adobe Digital Editions. Clicking the launch button to your right will take you to the Adobe site to download Digital Editions. If you already have an authorized copy of ADE you can skip this step and purchase your eBook by clicking order button below. The text is intended for the advanced student and the clinician who uses orthoses to treat mechanically induced pathology. The author and publisher have endeavored to make “Recent Advances in Orthotic Therapy” a step beyond what is currently being taught in the classroom, and create a compilation of documented and anecdotal evidence regarding orthotic decision-making. The text is a must for any practitioner who wishes to update their knowledge of the recent literature concerning orthotic therapy. The text is constructed in a manner to provide a logical approach to orthotic therapy, and therein establish the concept of pathology-specific orthotic therapy in the professions that prescribe orthoses for adults and children. It is believed that this text and its philosophy of pathology specific orthoses will improve clinical outcomes, promote more consistent research, and facilitate the acceptance of orthotic therapy as a valued therapeutic modality. Paul Scherer, DPM, MS has taught foot and ankle biomechanics for almost 40 years. He has held faculty positions in podiatric medicine at the California College of Podiatric Medicine and Samuel Merritt University School of Podiatric Medicine, and presently he is the clinical professor at Western University of Health Sciences, College of Podiatric Medicine. Scherer is an author of published scientific articles and the recipient of several research grants and academic awards. He is a Diplomat of both the American Board of Podiatric Surgery and the American Board of Podiatric Orthopedics and Primary Podiatric Medicine. He is also the CEO of a manufacturing laboratory in the orthotic industry. It has been quite some time since any book has approached the practice of orthotic management of common foot problems. Dr. Scherer is one of the most respected acamedicians as well as clinicians and brings to the reader a text that is both intellectually enlightening as well as hands-on practical. Many have criticized publicly and privately the use of custom foot orthotics, noting that there is very little evidence that custom orthotic therapy is firmly rooted in scientific literature. Dr. Scherer shows how this criticism is no longer valid. He explains how some of the most quoted anti–custom made orthotics literature is quite flawed in its methodology and cannot be relied on. In this book, Dr. Scherer brings to the reader important biomechanics theory that has been added to the literature since the basic Root theory that markedly aids the clinician in prescribing orthotics. Most literature that proposes surgical interven- tions for foot problems briefly mentions that orthotic therapy was unsuccessful. There is almost never any description of the prescription variables built into the failed orthotic therapy. Dr. Scherer brings into focus how important the small variables are in creating successful outcomes for various foot pathologies. The book has many pearls for differentiating various degrees of common diagnosis, and then shows how various therapies are needed for various severities of these problems. This concept is highlighted in the second chapter, which shows the proper uses of functional foot orthotics, Richie braces, and gauntlets for posterior tibial dysfunction. Other important therapy modifications are also presented in the other sections on plantar fasciitis, hallux valgus, pediatric flatfoot, cavus foot, tarsal tunnel syndrome, and knee pain. This book is directed to the clinician who already has a basic foundation of foot biomechanics theory and who has had some initial experience in prescribing orthotics. It assumes that the reader has a grasp of orthotic terminology and the Root theory of neutral orthotic casting. It has excellent illustrations to explain the solutions that it discusses. In summary, the book demonstrates that the clinician—and not the orthotic laboratory—needs to be in charge of the orthotic prescription. The reviewer strongly recommends that it be incorporated into the library of every clinician who prescribes orthotics, and that it should also be mandatory reading for all podiatric medical residents. The text by Paul Scherer, DPM, “Recent Advances in Orthotic Therapy” provides a fresh outlook on the techniques, modifications, and materials used when casting and prescribing custom molded functional orthotics. It is a much needed pathology based approach to mechanically induced pain or other symtoms, instead of simply relying on anecdotal and financially biased information that permeates the internet and non-scholarly literature. We finally have a text to help guide or orthotic prescribing in an easy to understand format. A well documented and practical textbook that foot specialists can use as an everyday guide for the practical biomechanical care of common lower extremity pathologies. At each chapter’s conclusion there is a unique “Orthotic Recommendations” page that can serve as a resource in the physician’s treatment plan. The rationale for various orthotic modifications are clearly and thoroughly explained. This book will serve to clarify the function and goals of various orthotic devices and how they can improve treatment outcomes. Despite the widespread use of foot orthoses to treat lower extremity pathologies, there are few texts or authoritative sources for students and clinicians who want to learn more about this form of therapy. This may explain why there is so much mis-information published in the lay media and internet about the effects, benefits and even potential harm of foot orthoses. At the same time, the past two decades have produced a wealth of quality scientific evidence documenting the effects of foot orthoses on the function of the lower extremity as well as clinical outcomes using these devices to treat numerous pathologies. This is exactly why Paul Scherer and his team published this textbook. 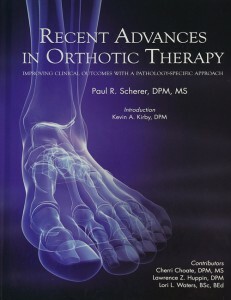 In his introductory note, Scherer hopes that his text will provide a “guide to the understanding of the documented value of orthoses (and) for prescribing the variations of orthotic materials or modifications.” After reading this book, it can be concluded that Scherer has not only succeeded in his goal, but he has also produced what will almost certainly become a mainstay treatment guide for mechanically induced pathologies affecting the lower extremity. In a nutshell, this book takes eight common lower extremity pathologies and provides a comprehensive review of recently published peer reviewed research relevant to the pathomechanics and the effects of foot orthoses for each condition. From this evidence, Scherer develops the first-ever pathology specific approach to custom orthotic prescription writing. This is presented as a template which is modified for each condition specific to casting technique, positive cast correction, orthotic material, posting, additions and extensions. Scherer admits that much of the scientific evidence published on foot orthotic therapy utilize a wide variety of designs and materials and the ultimate recommendations he makes are based upon his own interpretation of the research as well as anecdotal evidence obtained by his forty years of clinical and academic experience. In reading Scherer’s interpretation of the clinical relevance of published research, it is clear that his conclusions are made very carefully and objectively. Variations and modifications of standard orthotic prescription writing are proposed in a sensible, credible fashion. This book begins with a wonderful overview of the history of foot orthotic therapy written by Kevin Kirby D.P.M. This section not only reviews many of the scientific studies later quoted by Scherer but also presents many different theories of how foot orthoses achieve their treatment effects. In Chapter One, Scherer introduces the concept of pathology specific prescription writing for custom foot orthotic therapy. If someone does not have time to read this entire text, this chapter not only provides a wealth of scientific evidence, it gives a marvelous overview of the current state of the art of orthotic fabrication, cast correction options and variations of materials and additions. Although each of the subsequent chapters are extremely comprehensive and valuable, my favorite is the chapter devoted to the Pediatric Flatfoot. For those practitioners who do not prescribe foot orthotic therapy and who may only do surgery, this chapter is required reading to see a comprehensive review of the literature and a fascinating discussion about the controversies and debate about treating this disorder. Another pleasant surprise is the final chapter entitled “Prefabicated Functional Foot Orthoses: Validity and Efficacy.” This relatively brief section elegantly reviews the published literature comparing prefabricated and custom foot orthotic therapy and gives keen insight into why controversy continues to exist about the benefits of one type of treatment versus the other. Furthermore, Scherer gives some excellent guidelines about the design characteristics of prefabricated devices and indications for their use based upon previous scientific studies. Once the reader has completed this book, it cannot be put away on a shelf or given away for others to read. It should be kept in the clinic as a valuable reference guide for quick access whenever a challenging patient presents with a mechanically induced lower extremity pathology. Just thumb to the “Orthotic Recommendations” page at the end of each chapter and follow the check list for your orthotic prescription. Chances are that your patient will then have a favorable outcome. After all, its all about the science!